Do you love your Harley? Love it even more with items from Adventure Harley-Davidson, online at AdventureHarley.com. Adventure Harley-Davidson offers a wide range of Harley apparel and accessories including jackets, helmets, jeans, jewelry, and more. In addition to all of those Harley accessories, you can even buy a whole new or used bike plus stock up on parts. Check out RetailSteal.com for all the top Adventure Harley coupon codes, Adventure Harley promotions, and Adventure Harley discounts. Adventure Harley-Davidson calculates shipping costs based on the weight of the package. Any new unopened items returned up to 30 days will receive 100% credit for the item returned. Damaged packaging and returns after 30 days receive 80% credit. Installed Parts or after 60 days are not returnable. See site for full details, exclusions may apply. Shop at Adventure Harley-Davidson and enjoy 5% savings on featured Tshirts. Click here for code. Enjoy a 20% discount on featured products when you shop at Adventure Harley-Davidson. Find jackets as low as $65 at Adventure Harley-Davidson. Shop at Adventure Harley-Davidson and save up to 70% on clothing. Get free shipping on orders over $50 online at Adventure Harley-Davidson. Click link for savings. 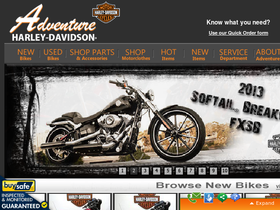 At Adventure Harley-Davidson find tons of Harley-Davidson parts and accessories. Check out the select items at AdventureHarley.com that are in the sale and clearance section. Shop at Adventure Harley-Davidson and enjoy $5 savings on a tee. Click here for code.